2019 application materials are now available! 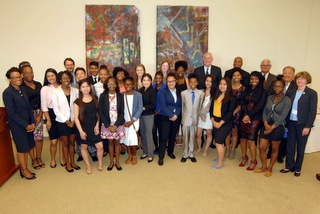 The Marquette Law School & Eastern District of Wisconsin Bar Association co-sponsor an annual Summer Youth Institute (SYI). The SYI is designed to introduce middle and high school students from the City of Milwaukee to the legal system, expose them to careers in law, and provide them with practical tools for achieving their educational goals. The SYI is open to students who will enter the 8th, 9th, or 10th grade next fall. Enrollment is limited to approximately 24 students. This program seeks to enroll students who demonstrate motivation, maturity, and a genuine interest in pursuing academic goals. Students must live and go to school in the City of Milwaukee. Students who are either be first-generation college bound (neither of your parents have a college degree) or use English as a second language are strongly encouraged to apply. Download our new flyer to share with your classmates. And be sure to check out our updated newsletter for additional SYI information. Read the State Bar of Wisconsin's article about the 2018 Summer Youth Institute. SYI is held at Marquette University Law School, 1215 W. Michigan Street in Milwaukee. The program provides fun and educational day programming. The program is FREE to all selected students. Milwaukee County Transit System bus passes will be provided to students as needed. The program includes interactive lessons, critical thinking exercises, writing and oral advocacy, instruction from guest speakers, and field trips to area law firms, corporations, and courthouses. The full program schedule can be viewed here. The goals of the program are to provide access to a law school educational experience for first-generation, low-income, and/or underrepresented students in law school programs, and ultimately, to contribute to the diversification of legal practitioners in Milwaukee and beyond. Gain insight into the college and university admissions process and financial aid resources. Upon successful completion of SYI, students will have the opportunity to participate in the Eastern District of Wisconsin Bar Association's Hon. Charles N. Clevert, Jr., Mentoring Program. Participating students will be matched with an attorney mentor for the next academic year and will continue to learn and explore. Recognizing that the involvement of adult role models is critical to a student’s educational success, a special orientation session is held for parents/guardians/mentors to learn the steps involved in helping students navigate the process of taking standardized tests, applying for college, and exploring financial aid. Parents or guardians are also invited to attend the oral argument presentation and to stay for the celebration lunch and closing ceremony. SYI is free to students. Milwaukee County Transit bus passes will be mailed to students prior to the first day as needed. Marquette University Law School is located on bus routes 10, 12, 14, 23, 30, and 31. The law school is shown as #7 on the Marquette Campus Map. SYI has two program coordinators who will supervise participants and provide guidance throughout the program. Phone contact is possible but may be limited at times during the day. Please feel free to contact 414-288-7924 with any questions. Program communications are done almost exclusively by email. A student will not be emailed unless a parent and/or school counselor's email address is also included on the communication. Parents are strongly encouraged to regularly check emails and, when appropriate, reply promptly. If you do not have an email account, consider setting one up to help your child successfully navigate the exchange of information about the Summer Youth Institute. Your child's school or your local library can help. We will work with a family who does not have email access. In these instances, prompt replies to mail and phone communications are required. If you phone number or mailing address changes, please notify us at 414-288-7924. Summer Youth Institute program staff can be reached by email at SYI@marquette.edu or by phone at 414-288-7924. Visit the Program Application portion of this website.